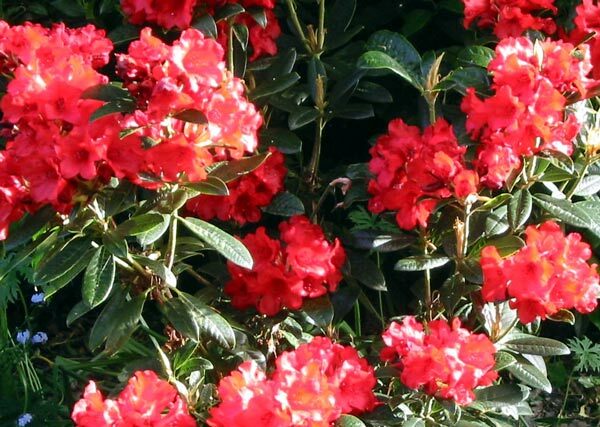 This is one of my bargain bin rhododendron specials, glowing red in the late-spring sunshine. It's planted over the water race in the back of the Dog-Path Garden between a variegated Dogwood and a red Maple tree. Since it came to me at a ridiculously low cost from a nursery bargain bin I've never known the rhododendron's name or how big it would eventually get. It's always seemed happy with the assorted shrubs and trees in the Dog-Path garden, but I've had to be careful of ther nearby Viburnum Tinus shrubs. They'll try and crowd anything out! I've also pruned out limbs of neighbouring Pittosporums so that I can see this beautifully coloured rhododendron in flower from the other side of the water race. It's easy to miss these back-of-the-border plantings when the weather is dodgy and garden walks are often kept close to the house. For the identification record, it flowers mid-season and is now head-high. And there's still enough room for any future growth.